LAST WEEK MINNESOTA Public Radio’s “State of the Arts” blogger Marianne Combs put out a call for photos and stories celebrating the great architecture of Minnesota. I figured given how much I appreciate old buildings—and that would be considerably—I could submit an entry. But what building would I choose? Faribault topped my choices since this southeastern Minnesota community, my home since 1982, has many, many buildings on the National Register of Historic Places. And, yes, architecturally, these structures are jewels. Then I considered images from Lucan, Morgan, Hanley Falls, Wood Lake, West Concord, Mantorville, Alexandria, Northfield and a few other towns I can’t immediately recall. Yes, the list was long. But something kept tugging at me—my loyalty to my hometown of Vesta. Now those of you familiar with Vesta, population around 350 and with a block-long main street, are likely wondering what on earth I found in this southwestern Minnesota prairie town of architectural worth. Here is the building I chose and which debuted Marianne Combs’ Minnesota architecture series this afternoon. 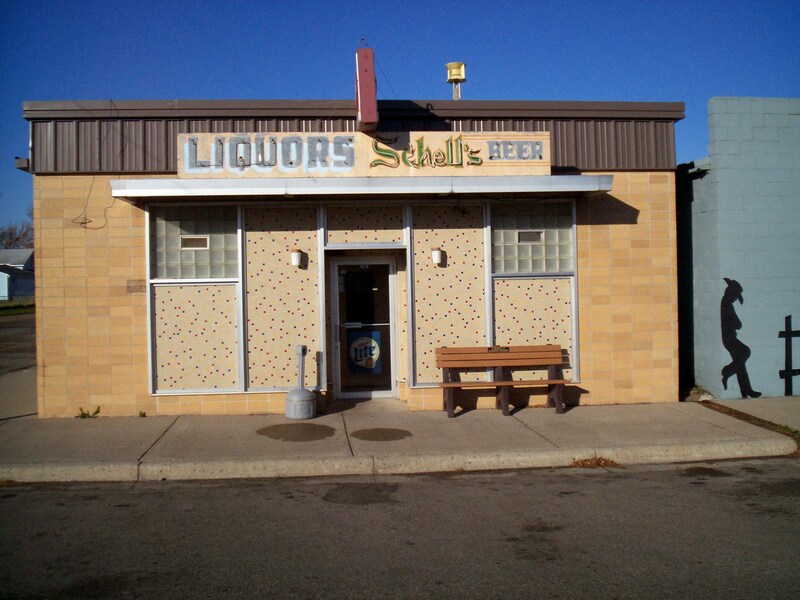 You can click here to read why I chose the Vesta Municipal Liquor Store. TYPICALLY, I WOULD NOT criticize a veterans’ memorial project. I respect those who have served our country and those who lead efforts to honor them via public memorials. However, last week when I saw the latest addition to the in-progress Rice County Veterans Memorial Expansion Project at the county courthouse in Faribault, I could not believe what I was seeing. The new, fake torch at the Rice County Veterans Memorial at the courthouse in Faribault. Here you see the wing tip of the bronzed eagle below the torch. I have not edited this image taken one evening last week. My initial reaction has not changed since I stopped that night to closer inspect and photograph this neon torch better suited for a casino—anything but a veterans’ memorial. As we all know, first impressions count. In this case, the neon flame certainly does not fit. This is supposed to be a place of reverence, of quiet meditation, of respectful honor for those who have served the United States of America. A fake, flickering fire does not portray that message of honor. 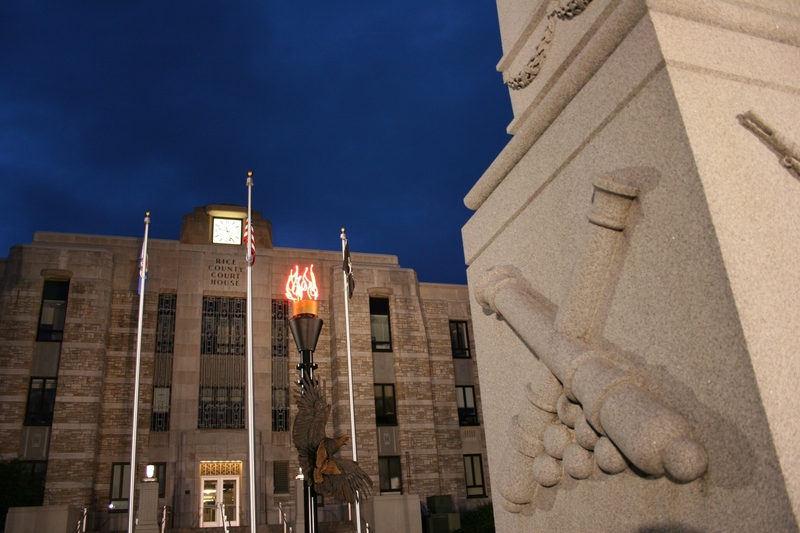 Prior to installation of this imitation torch, a fuel-fed torch burned near the historical Civil War statue which has long graced the courthouse lawn. Apparently that flame went out all too often, leading to its removal and installation of the Vegas style torch. 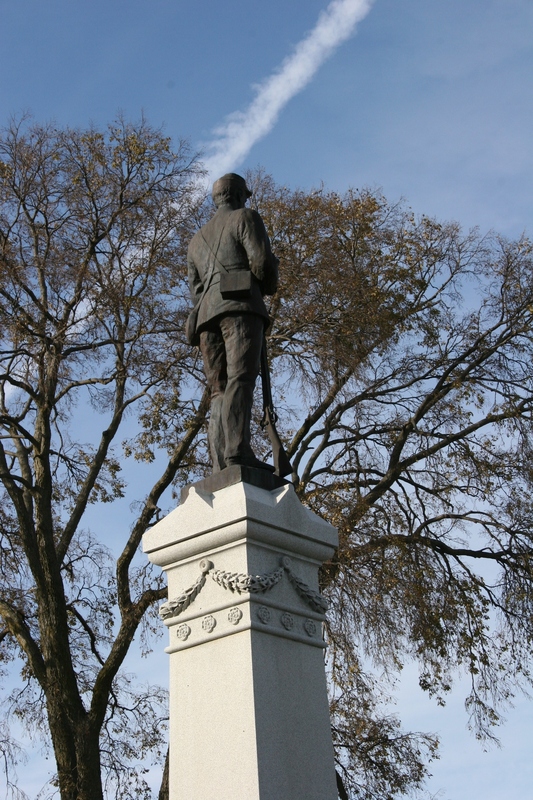 The long-standing Civil War statue sets a historical mood for the Rice County Veterans Memorial. I shot this image last fall. To the right, in this unedited photo, you'll see a side view of the historical Civil War marker. In the center is the torch and the bronzed eagle and dove with flags and the courthouse in the background. I could go on and on about how much I dislike this cheapening alternative, how it fails to fit the historical context of this place, the courthouse architecture or the long-standing Civil War marker. I won’t because I’ve said enough. View my photos and tell me what you think. I’d like your opinion. 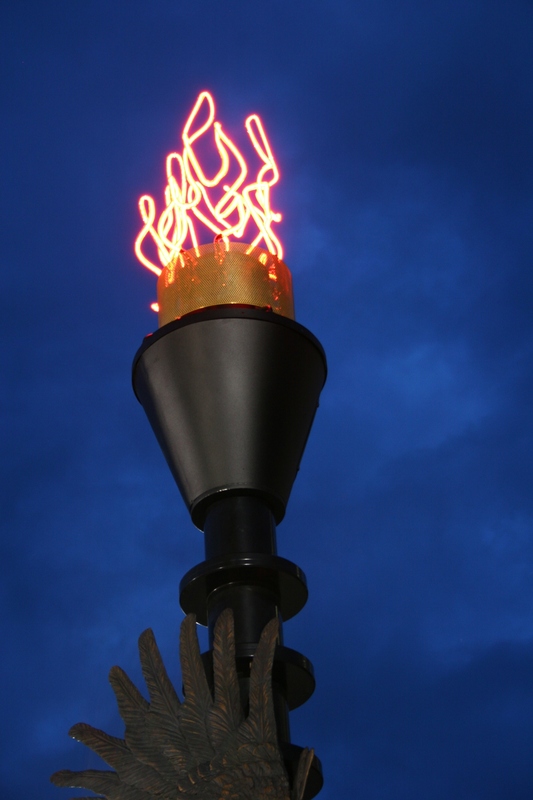 But even more, if you agree that this style of torch does not belong at a veterans’ memorial, offer a solution. I have none. Except to pull the plug. 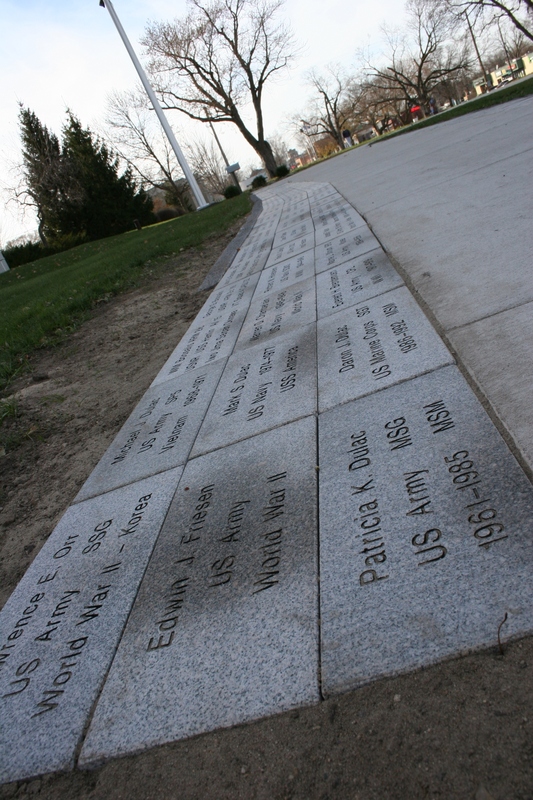 Honorary pavers line sidewalks leading to the center of the Rice County Veterans Memorial in this image taken last fall.